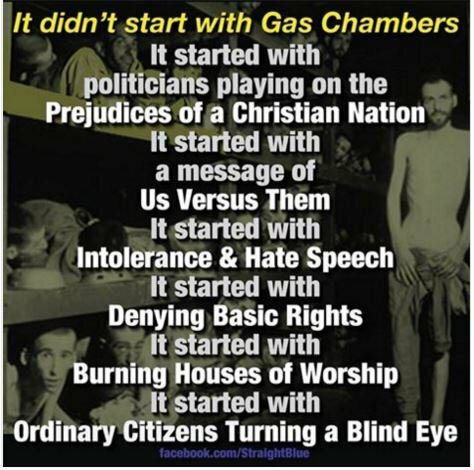 Listening to the current Republican presidential debates one can draw a frightening comparison to the early growth of Hilter’s Nazi Germany. The hatred, racism, bigotry and name-calling is ugly, divisive and wrong. Such rhetoric appeals to the fear and baser instincts of the unintelligent and uneducated, but does not reflect the moral and spiritual foundation of our nation. No nation will be called great that demonstrates the values of greed, fear and zenophobia being so loudly proclaimed by the two remaining Republican candidates for the highest office in the land. Turning a blind eye in the late 1930s led to the deaths of untold millions and a global war whose impact is still being felt. All of us need to open our eyes and see what is happening. We need to open our ears and truly listen to what is being said. Then we need to do whatever is necessary to insure our nation doesn’t take the low road. It’s the road that leads straight to hell. This entry was posted in Hunger & Poverty, News & Views, Quotes and tagged basic rights, bigotry, Christians, citizens, gas chambers, hatespeech, hell, Hilter, history, intolerance, low road, nation, Nazi Germany, politicians, prejudice, Republican candidates on March 28, 2016 by Ray Buchanan.